Posted under Health Guides. Updated 20 March 2018. Is it appropriate to disclose? Some people choose to disclose to many others, some people choose to disclose to a few, some people choose one, and some don’t disclose at all. Who do you want to tell? Why do you want them to know? What are the advantages and disadvantages (pros and cons) of telling them? How will disclosing my HIV status affect me – will I regret it later? Will I experience stigma? According to The Stigma Project, HIV stigma refers to the HIV-related shame, fear, prejudice, discrimination, guilt, and lack of knowledge that exist in the world at large. It affects the health and well-being of both HIV-positive and HIV-negative individuals. Remember that disclosing (telling people about) your HIV status is a personal choice. There may be advantages and disadvantages to disclosing your status. It can help to write down a list of potential pros/cons. In the sample below, Mike is thinking about disclosing his status to a friend. 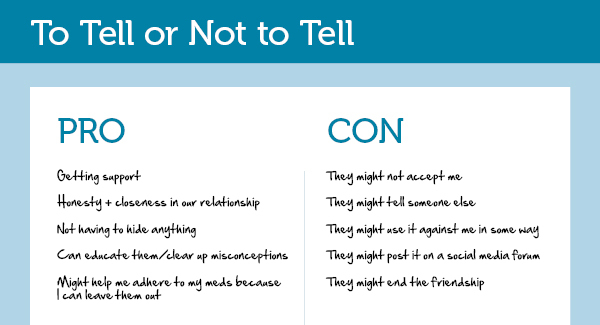 You may have different concerns depending on the type of relationship you have with the person you’re thinking about telling. What does he/she know about HIV? What are his/her attitudes about HIV? Can he/she keep a secret? What would happen if he/she didn’t keep my status a secret? Is sharing my status with this person going to be a relief for me? Will this person be supportive towards me? Thurston, I. B., Bogart, L.M., Wachman, M., Closson, E. F., Skeer, M. R., & Mimiaga, M. J. Adaptation and Pilot Trial of an HIV Medication Adherence Intervention for Adolescents and Young Adults. Cognitive and Behavioral Practice, Special Issue. Mimiaga, M.J., Bogart, L.M., Thurston, I.B., Skeer, M.R., Wachman, M., Closson, E.F., & Safren, S.A. (2012). Positive Strategies to Enhance Problem-Solving Skills: Positive STEPS. Therapist & Participant Manuals. Thurston, I. B., Bogart, L. M., Fields, E. L., Skeer, M. R., Sticklor, L., Closson, E. F., Safren, S. A., & Mimiaga, M. J. (May 2011). Qualitative Comparison of Barriers to Antiretroviral Medication Adherence among HIV-infected Youth. Poster presented at M. Judah Folkman Research Day, Boston, MA.